Since its creation in 2014, USB-C’s ultimate goal is to revolutionize the interactions between devices by simplifying data and power solutions into one, universally compatible cable and receptacle type. This technology is capable of handling data transfers, supplying power, and video/audio input and outputs making a very flexible and powerful connection platform. Once fully implemented, this connector type is poised to replace most if not all of the cables we use in between devices such as TVs, PCs and laptops, external storage devices, and even monitors. Experts state that as more and more compatible devices enter production and slowly fill the retail shelves, eventually, the existing standards and connectors we use today will be replaced by this specification. In the future, we might even see wall sockets with receptacles for these cables instead of the regular two-prong or three-prong power plug. One of the immediate beneficiaries of this technology’s capabilities is, of course, monitors. It’s applicable for an Apple monitor, an Apple cinema display, or a monitor for your MacBook Pro. Currently, we use a minimum of two to three cables on this peripheral while operating. These usually comprise of the power, the signal input (HDMI, DP, DVI, etc. ), and a USB type A or type B cable for other accessories. These various wires make a lot of mess if not placed correctly, and they also affect size, power requirements and pricing of most devices since additional different cables mean more receptacles or ports which in turn, requires more raw materials for processing and manufacturing. Once fully integrated into display technology, we may see newer products with only one Type-C cable handling all the tasks these cables work on in a single, marginally thinner and cost-effective connection solution. Pretty exciting since the application of this concept will give way to thinner, energy efficient and affordable display products making the viewing experience universally convenient and user-friendly. Since the technology is quite new, the digital world has only begun to witness the benefits. There are still limitations and compatibility issues, and technological advances such as Intel’s Thunderbolt 3 (USB Type-C exclusive) is still under continuous development and limited application. But despite these hindrances, the future is inevitable. In the monitor market, manufacturers are now beginning to ship out products compatible with these technologies to give us a glimpse of the streamlined and convenient future we are about to experience. These products rely on USB Type-C for audio and video input, data transfers including device recognition and power delivery between devices to create a universal digital ecosystem between these new gadgets. So far, compatible host devices come in a mobile form such as Google’s 2016 Chromebook and Apple’s 2016 MacBook Air, which are laptops reliant on USB Type-C as an exclusive connection for power, data, and signal exchange. The technology is young, so there aren’t a lot of available devices that can take advantage of the benefits. But, considering the direction the current trends are taking, we may as well bear witness to phones, desktop computers and media boxes that can support Type-C tech. 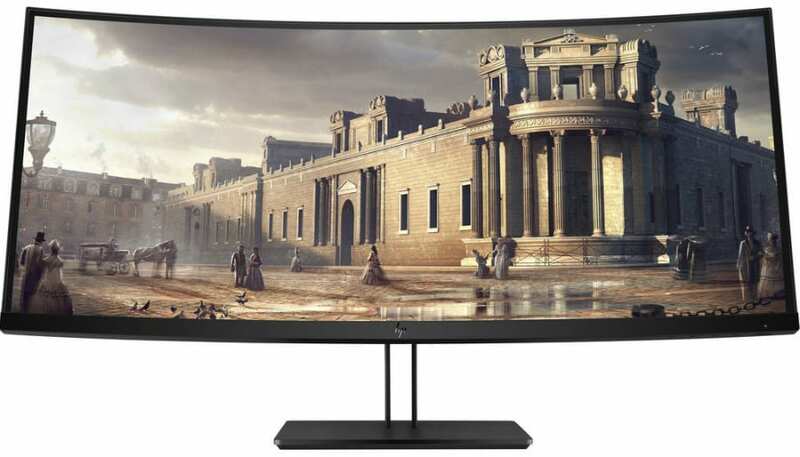 In this buyers guide, we have listed the pioneering monitors that are USB Type-C compatible. There are still existing limitations such as charging wattage, but since these products are early adopters, they are currently the best future-proof display solutions the market is offering. 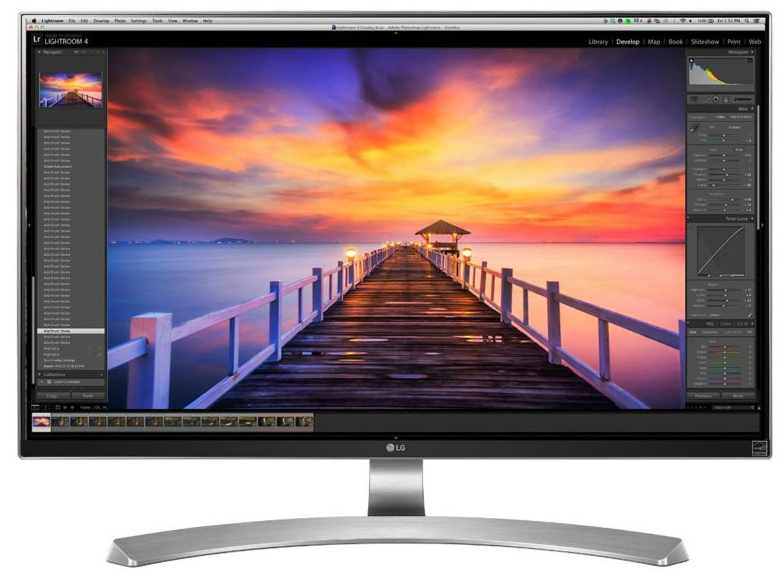 If you’re looking for a professional monitor for photo and video editing, look here. The Asus PA32UC is one of the few monitors that can offer a true HDR experience. The gorgeous IPS display is backed by a 348-zone direct LED matrix that can pulse up to 1000cd/m2 for HDR content. The monitor’s 10-bit IPS panel is able to produce comprehensive gamut volumes and a class-leading 1200:1 to 20000:1 contrast range. All of these scores are readily accessible right out of the box thanks to the brand’s fantastic factory calibration which is the pinnacle of the ProArt branding. It’s also equipped with two USB-C Thunderbolt 3 slots which allows you to charge laptops or daisy chain two of these babies. 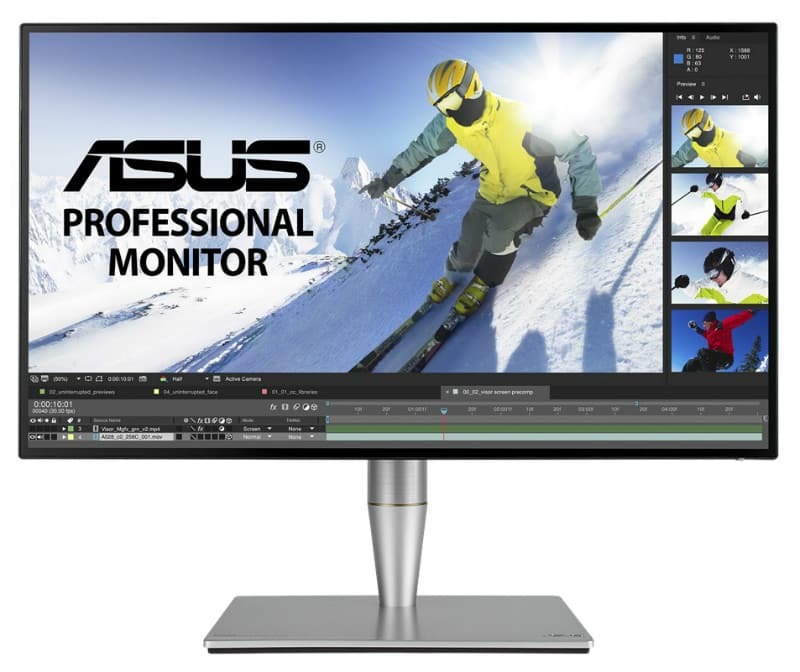 Asus meticulously built this monitor to cater to the most demanding clients, and the performance numbers are a testament to that. The LG 27UK850, the USB-C equipped variant of the 27UK650, is one of the easiest to own 4K displays of this generation. The 27-inch screen and the 3840 x 2160 resolution provides crisp and detailed images is great for both work and play. Like the 27UK650, this variant offers accurate and vibrant colors that can be enhanced with LG’s HDR implementation. Once hit with an HDR signal, the LG 27UK850 will automatically bring its HDR emulation to bear to add a nice depth to the shades. 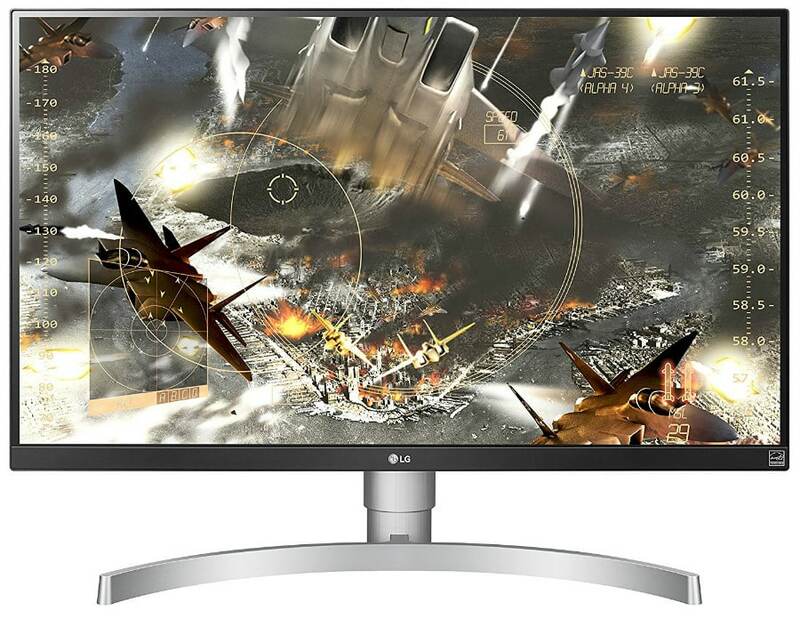 The monitor’s simplified design allows it to fit anywhere, including studios and gaming rooms. This is one of the best 4K USB-C monitors you can get for your 12 or 13-Inch MacBooks. This next product in our line up is a love child between two companies who previously never had collaborations on a scale like this. 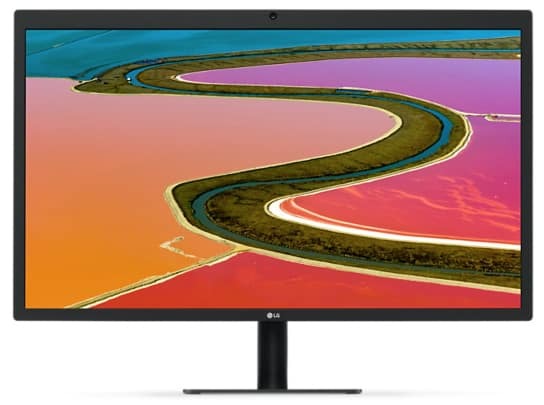 LG developed the LG Ultrafine 4K monitor with the close guidance of tech giant Apple, who until recently only offered their exclusive Retina displays for use with their computer products. These are the monitors that you will find if you visit the Apple Store. 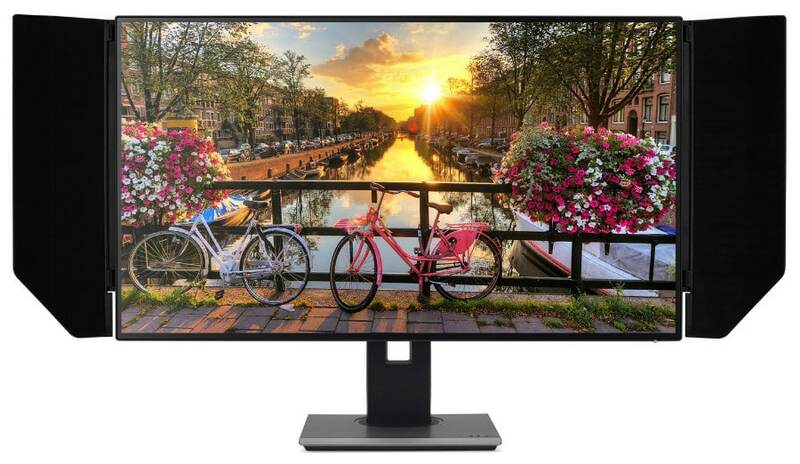 At first glance, the monitor is designed like any conventional, affordable product most users would buy for everyday use, but the rather small frame contains a 4k panel with a 4096×2304 resolution that packs 9.4 million pixels within the limited viewing real estate space. Images are stunningly brilliant at this pixel density, a feature popularly found on the more expensive Retina displays previously mentioned. Another similar feature to Apple’s proprietary tech is the wider coverage of the P3 color gamut and the 500-nit brightness. Color accuracy and contrast are hard to beat on these levels especially in a screen of this size. The IPS panel is also capable of 120Hz refresh rate, which translates to less tearing and blurring in games, even if the intended Macbook for this device isn’t fully capable of high-end gaming. But what makes this extraordinary is its exclusive use of USB-Type C ports for all input options, making this limited to their 2016 Macbooks who share the same restrictions. The USB-C port is capable Thunderbolt 3 specs and 60watts of charging juice, so as it is, you have enough power to dock your MacBook Air or Pro and have it always charging while in use. You won’t find the usual HDMI or DP ports, so you can’t use this gadget for your non-Apple devices as of the moment. Currently, more and more USB-C devices are in development, so in time this could be a viable option for other setups as well. Color accuracy and contrast are hard to beat on these levels especially in a screen of this size. The IPS panel is also capable of 120Hz refresh rate, which translates to less tearing and blurring in games, even if the intended Macbook for this device isn’t fully capable of high-end gaming. But what makes this extraordinary is its exclusive use of USB-Type C ports for all input options, making this limited to their 2016 Macbooks who share the same restrictions. The USB-C port is capable Thunderbolt 3 specs and 60watts of charging juice, so as it is, you have enough power to dock your MacBook Air or Pro and have it always charging while in use. You won’t find the usual HDMI or DP ports, so you can’t use this gadget for your non-Apple devices as of the moment. Currently, more and more USB-C devices are in development, so in time this could be a viable option for other setups as well. If the entry above is too small (which in my opinion, it is), then this is the bigger brother to fill the size gap. 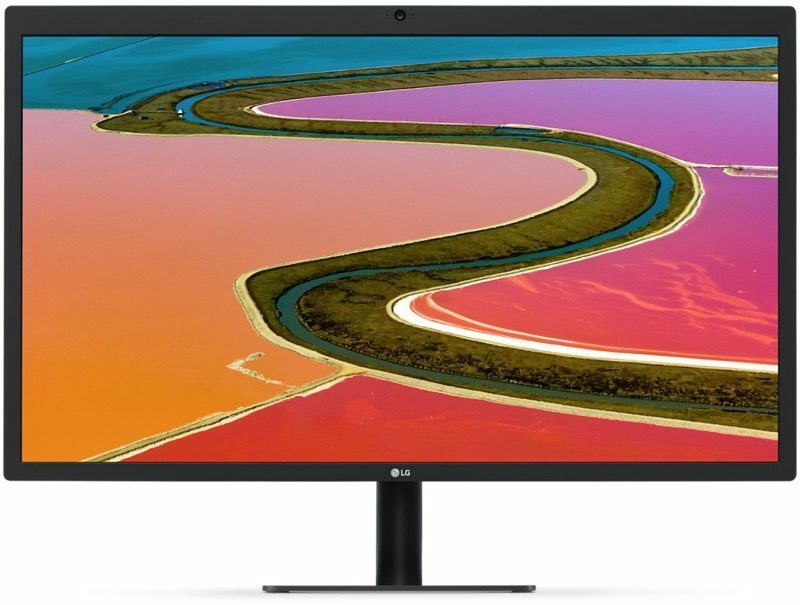 As the model name suggests, the LG Ultrafine 5k is a 27-inch beast which has similar features with the 4K 21.5 inch, but in a bigger body and resolution, a jaw-dropping 5120 x 2880. Pixel count is at 14.7 million, almost twice of what regular 4k monitors have, making the individual dots invisible to the human eye. This is the pinnacle achievement of Apple in their display tech, and also one of the biggest reasons professionals and critics highly acclaim the Retina technology. These two models also share remarkable physical attributes such as improved speakers with decent quality, a notable range of adjustments (despite a stiff-looking stand), a built-in camera and microphone, and of course, the USB Type-C I/O exclusivity. The difference between the Thunderbolt 3 ports of this model and the smaller sibling lies only in charging wattage, as this model offers up to 85 watts instead of the regular 60. So if you own a bigger Macbook, this monitor is the better option between the two. Another fact that sets this exclusive product apart from the competition is currently, this is the only 5k monitor that supports a single-cable requirement to be able to operate the 5k resolution at advertised specs since most usually require an additional adapter and a second Thunderbolt 3 cable. The difference between the Thunderbolt 3 ports of this model and the smaller sibling lies only in charging wattage, as this model offers up to 85 watts instead of the regular 60. So if you own a bigger Macbook, this monitor is the better option between the two. Another fact that sets this exclusive product apart from the competition is currently, this is the only 5k monitor that supports a single-cable requirement to be able to operate the 5k resolution at advertised specs since most usually require an additional adapter and a second Thunderbolt 3 cable. If you want excellent color accuracy and quality, the Acer PE320QK is your best choice below one grand. The Acer PE320QK is one of our top USB-C monitors picks for professionals who want a high-quality screen for color critical work. The gorgeous 32-inch 4K panel can be calibrated accuracy of only DeltaE 2.0 and a contrast ratio of 1470:1 for lush colors. Even if it drops sRGB coverage by a few notches, the PE320QK’s pre-calibrated preset is still spot on for photo or video editing. This 4K USB-C monitor is a perfect choice design-wise since it fills a few requirements most of our readers have. You get a large, crisp screen for less than a grand that comes with all the right features, including a 100-Watt USB-C receptacle. The reasonably-priced package even comes with anti-glare or calibration flaps for full effect! 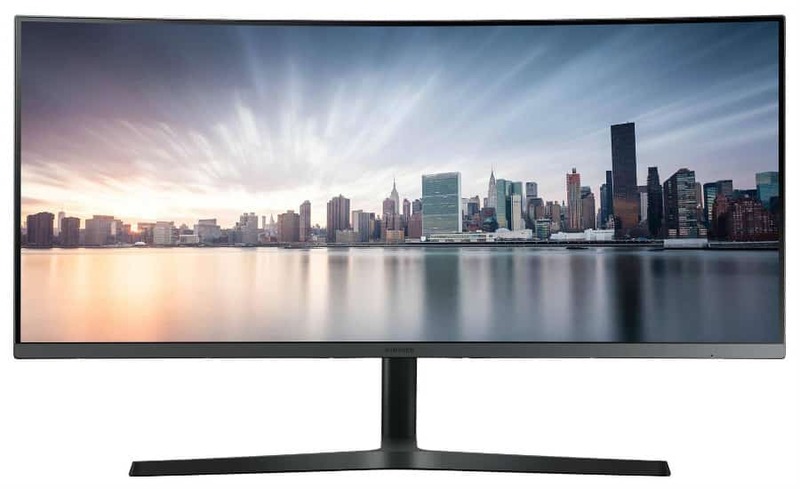 The Samsung C34H890 is a flexible offering since it is one of the few USB-C monitors that offers a bit of gaming prowess. The 3440 x 1440 ultrawide screen has a 100Hz refresh rate that’s complemented with FreeSync for smooth and tear-free gaming. Its 1800r curvature envelops you in visual bliss, while it’s low input lag makes sure you are always deadly and on point. Image quality-wise, the Samsung C34H890 doesn’t do so bad even if it underperforms in a few aspects. However it is understandable since you can get this massive device at a reasonable price, plus it is a productivity display more than a designer variant. If you want to streamline your workflow and enjoy games after work hours, this is the USB-C ultrawide to get. The BenQ PD2710QC is a stylish and modern display built for savvy home and office users who want excellent visuals. The product comes in a unique combination of black and silver with super slim bezels to create a product which appears twice as expensive as its asking price. The Ergonomics are superb and build quality is unquestionable, but what stands out is its USB-C slot with 61 Watts of power plus the base which doubles as a dock for your USB-C laptop. The big enough surface gently slants to cradle your device, plus it also includes USB 3.0 ports and a headphone jack for maximum convenience. This model is one of the few offerings available that can display perfect sRGB coverage with superb accuracy from out of the box, so users can enjoy using it right away. Combined with its 2560 x 1440 resolution, your work and games appear brilliantly clear and vibrant, pushing your experience past what vanilla monitors can offer. Also, if you dab in endeavors such as CAD/CAM design, the BenQ PD2710QC is well suited since it includes useful modes to advance its output to display wireframes or technical drawings with superior clarity. If that’s not enough, this model only clocks in at 10ms in input lag, providing a responsive and enjoyable casual gaming session after all the work has finished. The HP Z38C was designed to be a single, massive display solution for productivity and business applications. 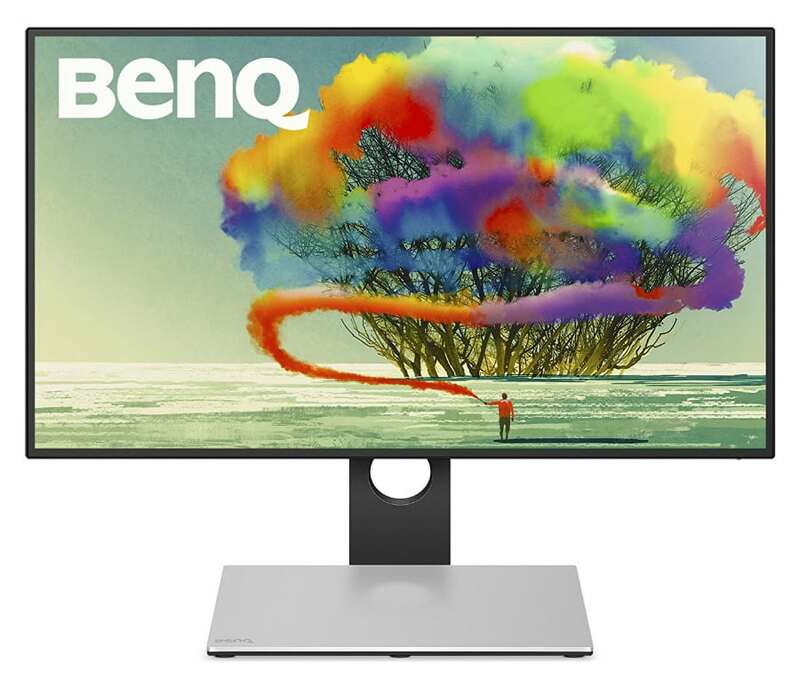 This 38-inch ultrawide monitor can be configured to work with an HP mini PC hanging at its back or connected to a USB-C laptop like the MacBook Pro. It’s a bit expensive, but the craftsmanship, features, and image quality are worth every dollar. 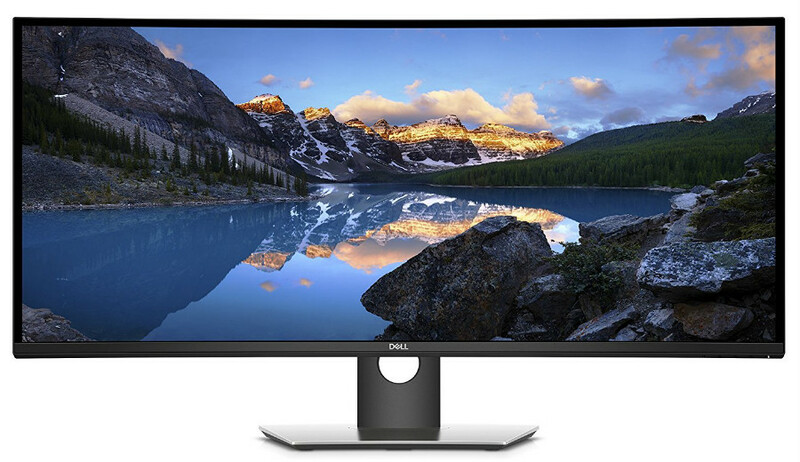 With the HP Z38C as your USB-C display, you get to enjoy a 3840 x 1600 IPS screen with decent color quality. You don’t need to calibrate this display to get the best out of it, although you should adjust brightness for comfort and eye safety. The Dell U3818DW is another behemoth with an impressive 3840 x 1600 resolution which provides a huge virtual space for productivity or entertainment. This model comes with the brand’s signature aesthetic treatment, but having a screen that size with extra thin dual stage borders easily makes it one of the most attractive spectacles anyone can have on a desk. Keep in mind that this model is almost 3 feet wide and weighs almost 30lbs, but it is well handled by the included ergonomic stand that has the flexibility of a 16:9 variant. The 38-inch IPS screen on the Dell U3818DW is equally engrossing, thanks to its 2300r curvature with fantastic vibrancy and accuracy which creates exciting visuals. The pre-calibrated screen is matched with functionalities that take advantage of its size and its rich I/O port which includes USB-C. The latter is one of the Dell U3818DW’s highlights since it can produce 100w of charging power which can charge even some of the more powerful mobile devices available, so your work and games while charging are secured. The Asus ZenScreen MB16AC is the most popular USB-C monitor that you can take on the go thanks to its sleek design. This notebook-sized display receives power and a video signal via a single USB-C connection, making it a convenient solution for extra productivity while on the road. At 50% brightness, the MB16AC eats up around 30% of your total charge time but in exchange provides a gorgeous 1920 x 1080 of precious real estate. This portable monitor is lightweight, and will slip right into your laptop sleeve or bag’s pockets. The Asus ZenScreen MB16AC also comes with a fitted tri-fold protector that doubles as its stand. It has a premium price tag, but its color-accurate screen is well worth the money. Currently, the choices available to us for these type of monitors is severely limited, which is understandable since mainstream products still adhere to the conventional standards such as DisplayPort, HDMI and USB 2.0, 3.0 and 3.1. Manufacturers are still taking baby steps in offering USB Type-C since as it is, the consumer’s reaction may vary. You can’t just shock everyone into accepting newer devices without them having a use for it because of compatibility issues. But back in the 90’s, Apple started a gadget revolution by adopting USB 1.1 into their early Mac models which in turn revolutionized the digital world. Fast forward to today, you can see USB receptacles everywhere, even in wall sockets found in modern homes. This time, they are doing the same with highly aggressive marketing in their new products, plus involvement in competing companies to develop products such as the two listed above. This fact, however, is not just about Apple, even if they are a huge proponent of the movement. Important limitations exist. Hindrances such as limited charging wattage, the need for adaptors and additional cables, etc. These products are the first generation, after all, and as with all early adopting technologies, there are glitches. The appearance of these monitors with Type-C and Thunderbolt 3 technology is a clear sign that the future is coming. In a few years time, we could see the pill-shaped Type-C on every digital device we buy and use. The start of the revolution in input technology for displays is a small glimpse of this so-called tomorrow, and we can only see the tip of the iceberg. Options are rather limited at the time of this writing, so we have only included the popular, highly rated and immediately compatible models these companies are offering. If you have the cash, the suitable hardware, and if you want to jump forward in time for a little, then these future-proof offerings are the best that your money can buy. I have one thing that I am worried about though, and which is causing me a lot of trouble in my search, and that is POWER! To me it’s not just a matter if the Macbook will charge, since with an i9 processor as well as a VEGA 20 graphics card, you won’t get full performance without the power to drive it. So… Which ones of these monitors can deliver a full 85W watts via USB-C? Hi, Gunnar! What’s your budget? We’re thinking the Acer PE320QK or the ViewSonic VP2785-4K should be perfect, but they cost almost a thousand dollars each. Hello, Victor! Can you give us the exact year or model number of your MacBook? I have a MacBook (Retina, 12-inch, Early 2015). The only port it has is the USB-C and I was told that a thunderbolt will be too slow and not work right. Are there any monitors for me? Hi, Laura! Check out the LG 27UK850 or the pre-calibrated Acer PE320QK which have USB-C slots that can charge your MacBook while receiving its display signal. Let us know which one you like! This conversation is missing one of the very best 27″ 4K monitors I’ve seen yet, and I went through several just to find the right one. The LG 27UK600 is priced around $450 and I use it with both a 2017 MacBook Pro 15″ and a new Dell XPS 13 4K laptop. Both work perfectly well with this monitor. It’s got an HDMI port and I use an HDMI-to-USB-C cable. Actually, it’s even more versatile in Windows 10 than with the MacBook Pro because Windows 10 allows you to stop the resolution from 100%-500%. This is great if you want a beautifully crisp 4K display but don’t want to put on five pairs of glasses to see the tiny font size caused by the high resolution. The edges show less than 1/4″ of black space so it really looks nice. Is the Acer XR382CQK able to charge a MacBook Pro via USB-C? Can’t seem to find those specs. ANy other affordable wide monitors that charge via USB-C for the new MacBook Pros? Hi, Temo! Yes, the USB-C on the Acer XR382CQK can provide battery juice for your MacBook Pro. Cheers! Hey Paolo, I’ve got the 38″ acer and plugged it into my brand new MBP via USB-C, and I’m only getting 30hz and not 60. Any advice as to why? I’ve also tested HDMI2.0 and same result. Hi, Andrew! Try turning off USB 3.0 functionality on your Acer XR382CQK. Go to Monitor Menu – System – USB 3.0 and turn it off. Hi there, these monitors look amazing but are there any under the $400 or even under the $300 price range??? Hello, Brandon! USB-C monitors are still considered a luxury nowadays, so they are priced heavily. One affordable model you could check out is the Philips 258B6QUEB which fits into that price bracket. Cheers! Hello, Byron! The LG 32UD99-W immediately comes to mind when we read your requirements, although it can only provide up to 60 Watts of charging power. Hi! Just received a new MacBook Pro from my employer and wanted to see if you had 2 or 3 recommendations for office (non gaming/movies) monitors. I need USB-C (T-bolt), and 20″-24″ is more than fine. I just want something crisp/clear that won’t leave me with eye strain, but I don’t need 5K because I’m just doing MS Office, email, Internet. I’d be grateful for your good/better/best recommendations. Thank you in advance! Hello, Andy! Currently, there are no Thunderbolt 3 monitors at that size. 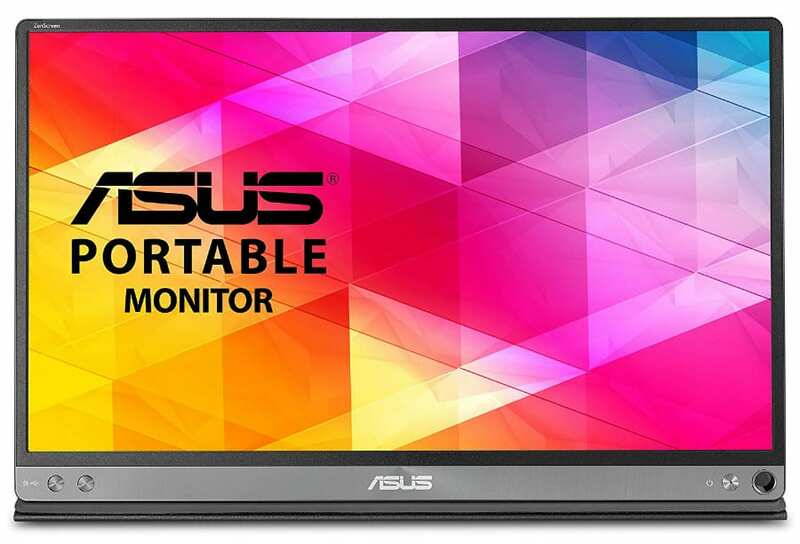 You should, however, look out for the Asus PQ22UC OLED portable monitor. Hey, Andy! USB-C monitors are unfortunately still too prohibitively expensive at this time. If you are open to using a USB-C hub/adapter, that will open up your choices. tell us your budget so we can better pinpoint a solution for you. Looking for a USB-C monitor that is works with MacBooks. Do you know of any that have an Ethernet port other than the Philips 258B6QUEB? Hello, Itommo! The BenQ PD2710QC which is designed to be a dock for laptops which includes a USB-C slot and an ethernet port on its base. Check it out! The H277HU has issues with latest osx, since June 2016. It just doesn’t work in hidpi mode, so it’s pretty useless. Apple support was useless (to be kind) so absolutely not a suggested buy if your target is macbook pro. Thank you for sharing this valuable information, Nicola! The Acer H277HU is not compatible with the 2017 MacBook Pro. They released a firmware update that should have fixed the problem, but it didn’t for me, nor a lot of other users on the Acer community forum. Although it’s more affordable than other monitors, please be weary if you have a newer Apple computer that you would like to connect to it. Hello, Nicole! Thank you for sharing critical feedback for the Acer H277HU, which functioned flawlessly for the 2016 version. We are as perplexed as the rest of the 2017 MacBook owners out there, but we will continue to search for solutions when either Acer or Apple comes up with them. Good luck! Is Acer xR382CQK would satisfy me with regards to its resolution and high-quality IPS? Hi Anna, the Acer XR382CQK’s 3840 x 1600 native resolution is nothing short of breathtaking, plus its IPS screen has an excellent vibrancy and color accuracy. We are sure this product will not fail to satisfy. Thanks for the quick response. Definitely would want to have them. May I ask which monitor would be best for my rig? I am into online gaming and would love to see my eyes to capture every corner of my screen for full performance. Hello Carl, may we know what your specs are and what expectations you have for a certain monitor? Sorry you forgot the PHILIPS 258B6QUEB real best ! If we get a chance to review it and do some thorough tests, we might add it for the next update. Thanks for the suggestion! LG have the LG 38UC99-W – but when I call to check – they would not warrant that it worked with apple macs! Hi there, Dave! If it was us, we’d choose between the LG 27UD88-W, HP Envy 27, or the LG Ultrafine 5K. But the thing is, all of these products have a matte anti-glare coating with the exception of the Envy 27 which uses an advanced haze treatment, described to sit in between glossy and matte. Good luck with choosing your new monitor! will the Acer H277HU charge the new Macbbook Pros when connected? Hi Javi, thank you for your comment. Yes, the USB-C port should charge your Macbook, but it might be too slow especially for the bigger models. There are also reports of some Macbooks not getting enough power to charge the battery while in use, and we think that this is because of the current limitations of the power outputs of these models.